With its warm weather and consistent sunshine, Florida offers year-round opportunities for golf enthusiasts. Many Florida golf courses provide championship playing along with spectacular views of the ocean, marshlands, mangrove thickets and wildlife. These courses sport a variety of different turf grasses suited to different needs to make the game more interesting for golfers. 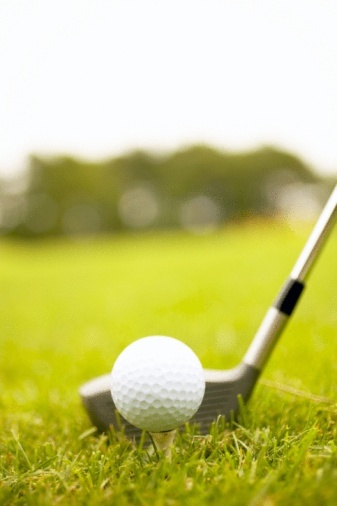 Florida golf courses use a variety of different types of grass for specific needs. The Florida climate creates certain challenges for golf course turf managers. Long, dry periods during the winter months require careful attention to irrigation requirements of varying types of turf. Turf grass for these conditions must be drought-resistant. 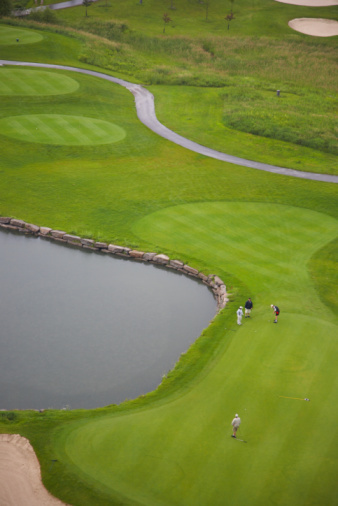 In summer, heavy rains can flood golf courses, providing the perfect hot, moist environment for turf pests and diseases, so grass cultivars must be disease-resistant with ability to withstand occasional insect infestations. In addition, the game itself requires that turf grass be able to withstand constant wear. These requirements make only a few types of grass the suitable choice for Florida courses. Bermudagrass is the most prevalent type of turf grass used on Florida golf courses. It was introduced from Africa, and in it's original form is low-growing and wiry. Hybridization has given it a better texture and long-lasting dark-green color specially developed as a turf grass, according to the University of California site. The common type produces its own seeds and can become invasive, whereas hybrid varieties do not produce seed. One of bermudagrass's problems, in fact, is that it can revert to original type and become aggressive, invading the hybrid grass. This is generally controlled in the early stages to eliminate the "off-type" variety. Zoysiagrass is another type of warm season grass used in areas throughout Florida, Texas, California and the southern United States. A native of China and Southeast Asia, zoysiagrass offers good wear-resistance and drought-resistance. It is moderately salt-tolerant, as well, which makes it popular for courses in coastal regions. Sandy soils are not a problem for zoysiagrass. It is a slow-growing type of grass, however, and though this makes maintenance easier, it also inhibits its recuperative power, according to Texas A&M University turf specialist Richard L. Duble. Seashore paspalum, Paspalum vaginatum, is warm season turf grass that is only now becoming noticed by golf course builders and designers for its many advantageous qualities. It is native to tropical areas and can withstand the high temperatures and heavy rains that are common in Florida. It is a salt-tolerant grass, which makes it a good choice for coastal areas where salt spray and salt intrusion into soil is a concern. It can even be irrigated with salt water, according to University of Florida turf specialist George Ralish. It can also tolerate recycle "graywater" which makes it the choice for green building considerations. Seashore paspalum does not produce viable seed, however, and must be propagated using stolons, rhizomes and sprigs. What Type of Lawn Grass Is Best for Sacramento & Northern California?